When I started this blog, this was my reaction to the news about a UK Referendum on EU Membership – at which I was not eligible to vote. As the news broke last Saturday that David Cameron had set a date for the British Referendum on EU Membership for 23rd June 2016, I felt a slow sinking feeling, as I realised that I would in all likelihood not be able to vote in the referendum by virtue of the 15 year rule. The timing of the referendum was also one that quickly sunk in – as I posted to a few facebook pages about a link relating to registration to vote in the UK, the timing sank in. I immediately dug out my National Insurance card no. 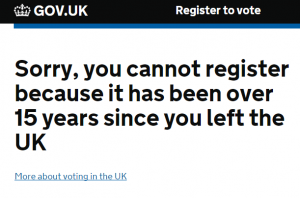 and passport details and visited the gov.uk page on registering to vote – https://www.gov.uk/register-to-vote and started to answer the questions about my previous voting history. I left the UK back in 2000, a fresh-faced graduate, to move to Vienna and never returned to the UK to work. All was going smoothly until the question popped up “When did you leave the UK? 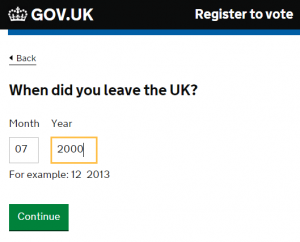 Answering the question confronted me with what I feared to be the case “Sorry, you cannot register because it has been over 15 years since you left the UK. I am the first to appreciate that ultimately my family and citizenship are my only ties to the UK. I’ve been in the Austrian system since 2000, have paid my taxes here, work for an Austrian government agency, speak the language and am politically quite disenfranchised – I can vote in Euro elections and local elections in Vienna, but not general elections (I accept the reasons why, but this doesn’t make it any easier to bear!) and since July 2015 I have been unable to vote in the UK. I admire First Past The Post as a form of suffrage, particularly in light of the fact that it ensures that even 4,000,000 purple meanies (UKIP voters for the uninitiated) can only get one MP into parliament, and it saves the UK, in all situations except for that of a hung parliament, from a grand coalition. I snidely point out the inefficiency of Austria in scraping a Schwarz-Rot coalition together for the nth time. The fact is though that I remain a British citizen. Many people in the UK don’t realise that double citizenship is not really an option for me – Austria does not permit it, and acquiring Austrian nationality is a long process – resources are currently over-stretched regarding processing of applications. After the 8 months of bureaucracy that my wife had getting a new Aufenthaltstitel, which doubles as a identity card that allows hassle-free travel within the Schengen zone (another thorny issue at the moment), I do not want to have to take citizenship unless I really need to. I am also relatively calm about the issue, in that I don’t see myself being turfed out of the country I have settled in on the day of my 39th birthday in the event that the British public vote “No”. This blog is set up to follow the EU referendum from the perspective of a British citizen who lives and works in the UK, but who cannot vote in the referendum. The next four months promise to be an interesting ride. It’s now December 2016, and according to certain quarters “the people have spoken” – the UK seems still to be very much divided and we are hurtling towards whichever flavour of Brexit our kitten heel-wearing Prime Minister wishes to emphasise this week. I might somehow be closer to being eligible to vote in the country of my birth again than I was at the time of the Referendum, while being closer to losing my right to vote in EU Elections and local elections in the country that has become my home, unless I chose to become Austrian.